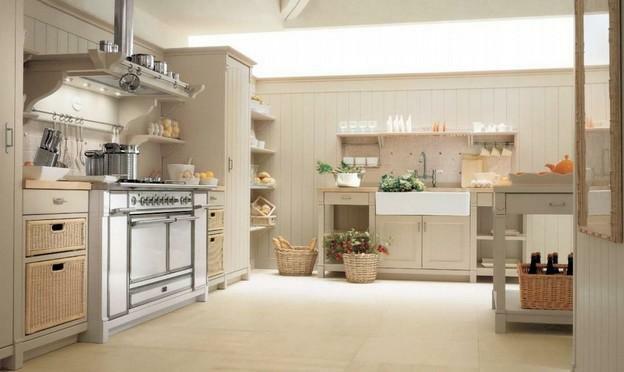 FeastHome – There are surely a lot of kitchen designs, one of them is a country kitchen design. 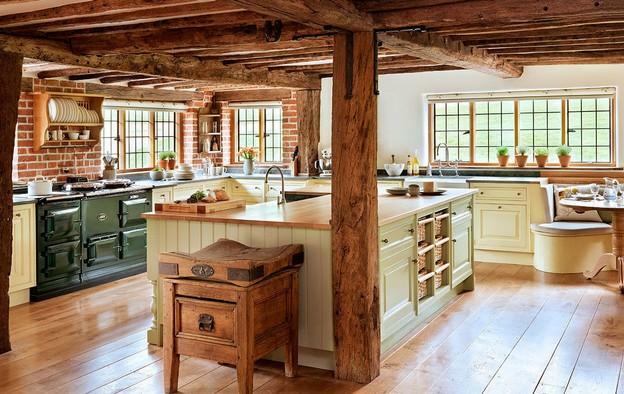 This kind of kitchen design may be suitable for you who adore a rural and traditional style. A country design is just right to be applied in a kitchen because it will make the area feels homey. If you are looking for the ideas of a country design for your kitchen, here are some inspirations. The white color used for the kitchen cabinets, walls, until roofs, that dominates this kitchen makes the area looks bright and clean. It is actually a smart tip to instantly make your kitchen looks clean and bright; use white as a dominant color. The slide French windows as the ventilation allow the sunlight and fresh air come into the kitchen area. The wall lamps bring a classy style. A unique rack is placed not far from the sink in order to accentuate a practicality. The rack is also able to be used as a decorative place to store the decorative dishes and cups. In order to avoid a boring atmosphere, a wooden countertop and wooden floor are installed. farmersdoors.comThis country kitchen uses a light tone for all the kitchen cabinets, which are quite a lot. So that the tone is dominating the area, instantly brighten the kitchen. The householders only place 4 small hanging lamps because the light tone is able to light up the kitchen area. The white French windows allow the natural sunlight comes through so that the householders do not have to turn on the lamps in the morning. The decoration is added in order to make the windows more stylish and the flower pot makes the area looks sweeter. The marble countertops are installed in order to support the cooking activity because this material is durable and strong. frankhouse.orgThis kitchen area uses 2 colors to dominate it, which are brown wood and white. These 2 colors blend perfectly, making this kitchen looks pretty. Some materials are also used in this area. 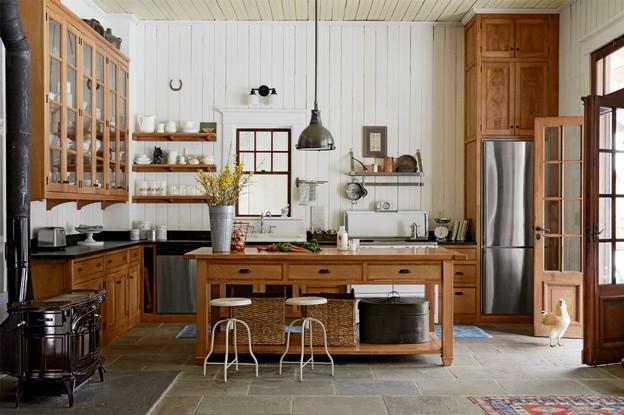 Such as wooden kitchen cabinets and door, and stone kitchen floor. These 2 materials bring the natural atmosphere to this kitchen. 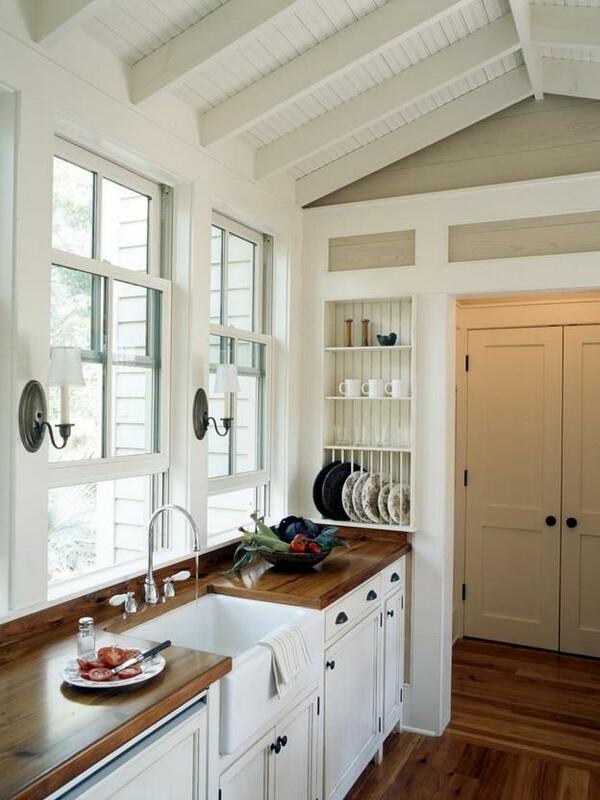 The white stripe wooden kitchen wall is also prettily included. The householders only place one long hanging lamp in order to add simplicity since there are already many materials and colors involved. The wall rack is able to be used to store the kitchen set as well as be a wall decoration. 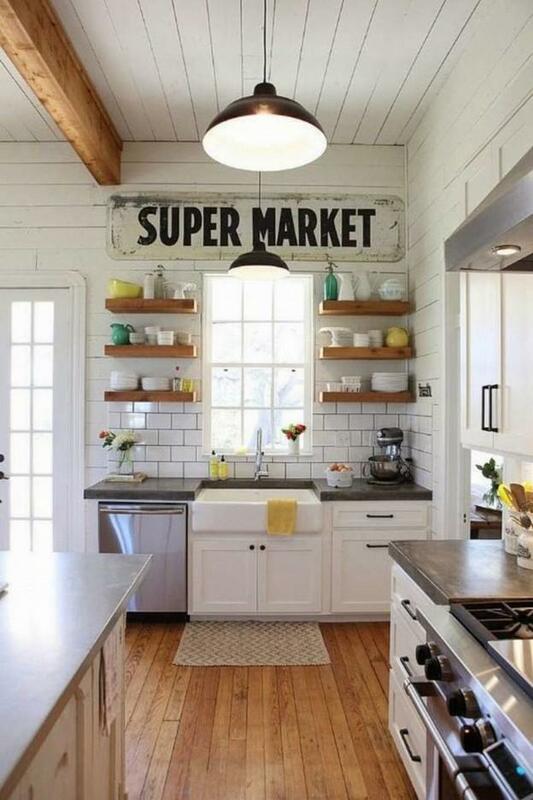 homebnc.comThe ‘supermarket’ wall decoration with an unfinished touch and wall rack make this kitchen looks unique. The wall racks are placed near the sink in order to store the kitchen sets and dish soap. This arrangement is very practical because it will make it easy for the householders to take the dish soap to wash the dirty dishes. Moreover, the householders simply combine white and wooden elements such as a wooden floor and wooden racks. This kitchen looks stylish through its simplicity. 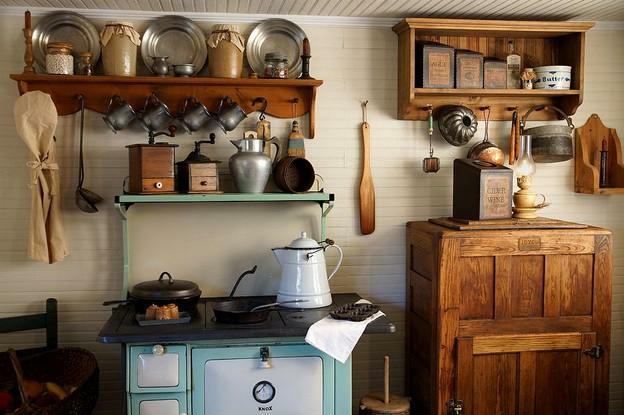 madlonsbigbear.comOnly 2 words that can describe this country kitchen design: beautifully traditional. The wood material dominates this kitchen. Look at the wooden kitchen roof! It is very unique and will make you feel like you are cooking in a kitchen of a fairytale. The householders combine 2 tones of natural wood colors. The dark tone of the wooden kitchen roof and the light tone for the wooden kitchen floor. 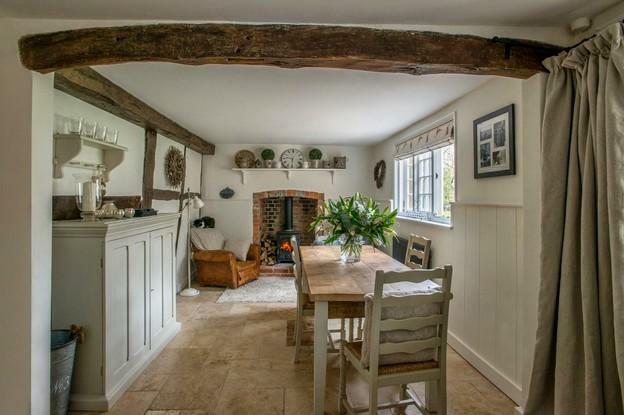 The brick kitchen walls complete the traditional style in this area. But, the kitchen cabinets and the windows add a little bit of modern style to this kitchen, making it less flat. digisysint.comEven though there are a bunch of stuff in this kitchen, the area still looks neat because of the use of a lot of containers. The containers are able to make the kitchen looks neat because the kitchen ingredients can be saved there. 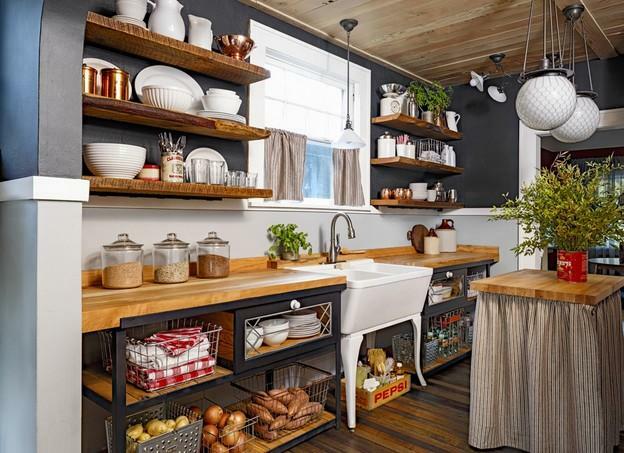 The wooden wall racks can be used to store the kitchen sets as well as a decoration for the kitchen walls. If you can see in details, this kitchen only contains the kitchen tables and sink. What makes it stylish and unique is because of the use of various types of hanging lamps. brandmadeby.usThis area is so calming because of the colors used; white, light grey, and light brown from the wooden dining table. The flower pot that is placed on the dining table makes this area looks sweet. The fireplace will be really helpful in creating a perfect place to enjoy a delicious dinner during winter and cold weather. Some decorations such as a family photo frame, clock, and other decorations placed above the fireplace successfully make this area looks less plain. This area is perfect for you who want a peaceful breakfast and dinner with your family members. www.squarechicago.comThis kitchen is spacious, and the light colors used make it even more spacious. It is actually a smart tip to make your small kitchen looks larger; apply light and bright colors. The light and bright colors are also able to make your kitchen looks instantly bright. So that you can use a minimum lighting. The sink and cooking area in this kitchen are placed quite far, providing a vast area for the householders to move. Some racks are placed in the corner to fill the area as well as storing the kitchen decorations. madlonsbigbear.comThere are quite a lot of things in this kitchen, but the householders neatly store them. The open kitchen cabinet, wall rack, and hook are used so that it will be easy to take out and put in the kitchen sets and utensils. An open kitchen cabinet and kitchen rack also make it easy for you to find the item that you need. A hook is suitable for you who want to simply hang the kitchen utensils. Those are ideas of the country kitchen designs which hopefully can be your inspirations. 10 Champion Retro Kitchen Appliances: Veteran Awakened! 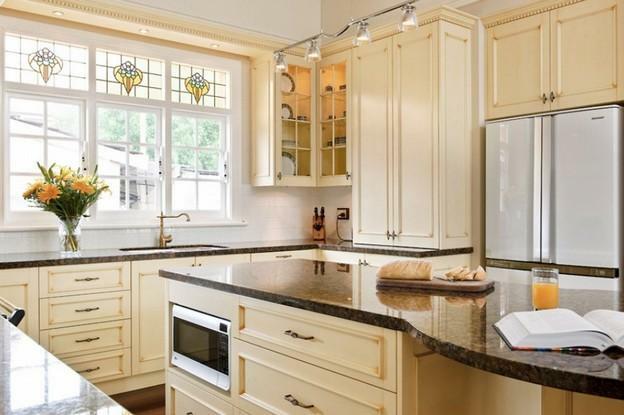 How to Decorate Your Kitchen Effortless?